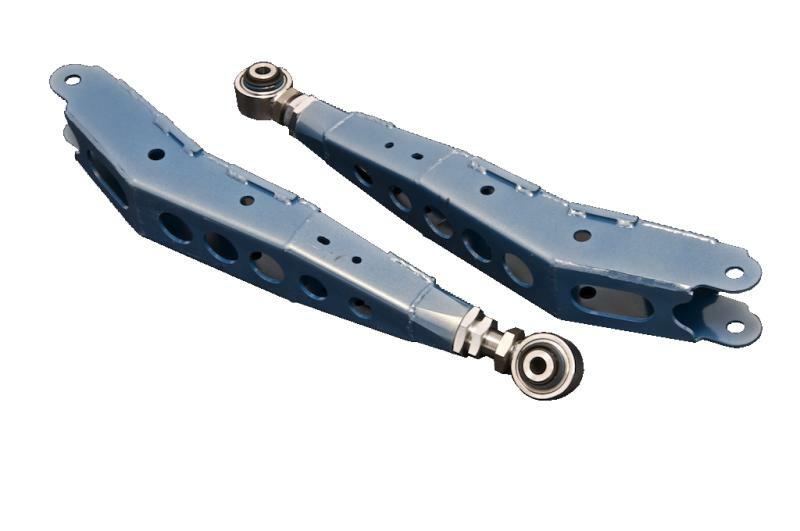 GTSPEC Rear Control Arms - Dezod Motorsports Inc - Home of the automotive performance enthusiast since 2002. GTSPEC rear control arm is used for track or street cars that require rear camber adjustment as a result of coilover installed or wider wheel fitment. In addition to camber adjustment, we redesigned our rear control arm brace to include a +30mm bend. When cars are lowered it creates a positive camber, which will generate extra stress on the stock control arm. Our new rear control arm is designed with a +30mm bend to compensate for the extra stress that was caused by lowering the vehicle. The +30mm bend is suitable for “1 to 1.5” drop vehicles. A stock control arm or stock like aftermarket control arm is mainly designed to adjust camber only and does not have this added feature. In addition, we have upgraded the end joints of our control arm to forged 7075 aluminum for extra strength and durability, unlike other competitive products. Not recommended for stock vehicle (non-drop). The rear of the car will be higher than the front.